So the last time we talked about my quest to find the perfect planner, I mentioned that I had challenged myself to make the perfect one with just stuff I had around the house. 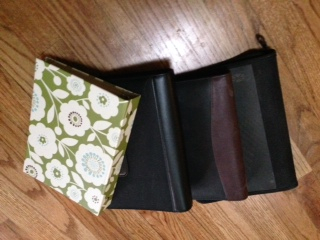 I have at least 3 or 4 planner binders, tons of spiral notebooks, and a couple of bound journals all waiting to be used. I had paper and dividers. The binders didn’t work because they were too bulky. I tried several spiral notebooks, but none had enough paper for me. Plus the paper was a little thin and there were no dividers or ways to add things. Plus I hate those undated calendars that you have to fill it with the month and date. I ended up sort of buying and making my new planner. So far it’s working, but it needs adjustments. I went to Staples and bought the Martha Stewart disc bound planner. I wanted to get the calendar, too, but they were out. 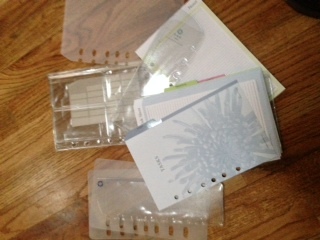 It does come with lined paper and a plastic divider, but I bought extra dividers cause I knew I would need them. I also bought some heavier paper (32 lb, maybe?) to print out my planner pages and a special punch to punch the holes in the paper. I dropped some cash, I gotta tell you. Then I went to the Polka Dot Posie and ordered a digital version of her planner sized for my binder. She isn’t kidding when she says it a project to put together, but worth it. I printed the entire thing – cause I didn’t know how to do anything else – even though all I wanted were the months. Then I cut them in half with my paper cutter, punched them, and put them in. There are a couple of cool things about this planner. It’s disc bound, which means that pages go in and out very easily. Those look like binder rings, but they are solid discs. The paper is punched in a way so that you can just pull a page out and then press it in somewhere else. The other cool thing is that the discs come in two sizes. If you need more space, you just buy the new discs and use the same planner. Pretty cool. So far it’s working for me, but it needs more. Right now behind my monthly pages are just lined sheets. I use them for ideas for ADD Moms, my new coaching business, and my writing for Answers.com. I am on the lookout for another printable for menus and grocery lists now. So far this is working for me. What are you using this year for your planner? This was my big challenge – but I didn’t need a calendar, I needed a dated task list. I ended up with a full size Franklin Covey task planner. As close to perfect as I could get. Does it have all that you need in it? I guess everyone’s needs are different, so even though I loved it for all it’s creativity, it just didn’t work for me. How does a dated task list work? 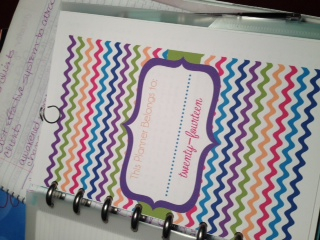 Do you like your Franklin planner? I always thought they were too big and bulky. I always thought FC was too involved, I needed just some free space and not a lot of structure. I have the Her Point Of View Wire-bound Six Month Planning Notebook in the 8.5X11 size. Each full page has the date in the corner and lines. So everyday, I write in my work tasks, then personal tasks. Then, for example, I can see today I have to follow up with Bob for a demo, and Bob says to call him in a week, I flip ahead a week and make a note to do it on that day. It’s like a running to-do list for me. I agree. The first one I bought had all these reference things in it. Do I need the area code in China? Why, yes, here it is. I’ll have to check out Her Point of View. 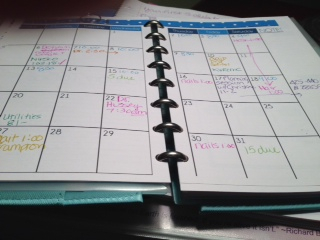 Years ago when I was a young mom, I used a plain spiral notebook. It had “the day” on it. Calls to make, what’s for dinner, what do I need to do. If I made a call or paid a bill, that info was on there too. Thanks. Off to check it out. Wow , you put a lot of work to this organizer, great job. I myself started using an app for this task . Thought it wouldn’t work that good, but it actually does a great job as well. What app are you using? I’m always torn between playing with paper and colored pens and using an app. Cool! Can’t wait to hear what you think.